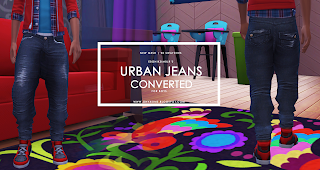 The lovely Dani allowed me to not only convert her Urban Jeans from adult to kid, but she also allowed me to edit the uv to better fit the game. If you are interested in her original jeans, you can find them here. My version comes in 20 swatches with 2 different texture options and you can choose to have the merged package or the two separate packages. The jeans fit almost all of EA’s shirts with little to no clipping at all, so yay!